Members of the House and Senate, seizing on the anti-Russia climate engulfing Washington like a fog, have authorized billions of dollars to enhance US-NATO military assets in Europe. Hundreds of millions more in “security assistance” is to go to Ukraine. Russophobia is costing American taxpayers a bundle of money, and US politicians and defense contractors couldn’t be happier. Further on, the NDAA calls for $350 million to “provide security assistance to Ukraine, including defensive lethal assistance.” The idea of sending lethal arms to Ukraine, where a civil war is smoldering on Russia’s border, could encourage Kiev once again to resort to violence in a further attempt to resolve the standoff. The problem with that explanation is that it is comprised of either bare-faced lies or gross exaggerations, immediately obvious to anyone with a clear picture of the game. Yet that is exactly what so many mainstream news consumers lack – a clear picture. As a result US lawmakers, in cahoots with defense contractors, are able to pursue such dangerous machinations with impunity. The West relies on the belief that most people would never bother to fact-check the claim that “Russia invaded Ukraine,” for example, which is a patent falsehood. Nor would they discover that the only reason “Russian invaded Georgia” is that Georgia launched a deadly attack on Russian peacekeepers during its offensive on South Ossetia on August 7, 2008. Despite a comprehensive EU investigation that concluded former Georgian President Mikhail Saakashvili was to blame for starting the war with Russia, EU leaders continue to shamelessly sell the myth of 'Russian aggression' to their constituents. Today, US-Russia relations have deteriorated to levels not seen since the Cold War standoff. And it must be said that for whatever differences there may have been between the Obama and Trump administrations, and there were many, the one thing that both have in common is their willingness to pack the former Eastern Bloc with US military hardware. Last summer, under Obama, NATO members agreed to the alliance boosting its military footprint in Europe to levels not seen since the Cold War – posting four rotating, multinational battalions to Estonia, Latvia, Lithuania, and Poland. 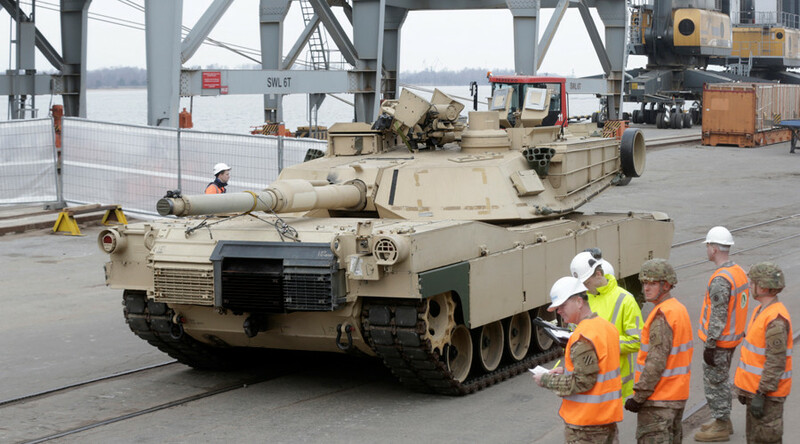 In January, just before Trump’s inauguration, some 2,800 pieces of US military hardware – including Abrams tanks, Paladin artillery and Bradley fighting vehicles – and 4,000 troops rolled into Europe as part of the operation. Even non-NATO member Sweden played host to around 2,000 foreign troops, more than 1,400 of whom are from the US, according to the local Sydöstran newspaper. NATO members Denmark, Estonia, France, Lithuania, and Norway are also participating, as well as non-aligned Finland. Trump has done nothing to reverse the trend – in fact, he is encouraging it. Meanwhile Moscow, which has been forced to respond to this swift militarization on its borders, was criticized last month by Western capitals for holding joint Russian-Belarusian ‘Zapad-2017’ drills. Russian Major General Igor Konashenkov said the US military could easily redeploy its military personnel from the German Ramstein base to Poland within just two hours. He also countered NATO efforts to downplay the amount of hardware accumulating on Russia’s border. 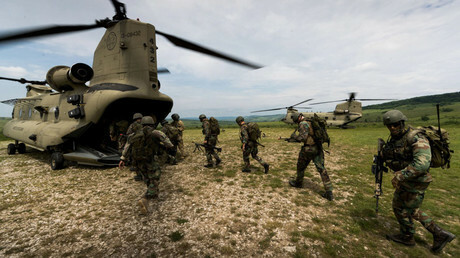 “In contrast to the claims of NATO and the US on the insignificance of the troops approaching the Russian border, in fact now it is not a brigade there but a US mechanized military division,” he said. Amassing such military power on Russian borders violates the 1997 NATO-Russia Founding Act, he emphasized. 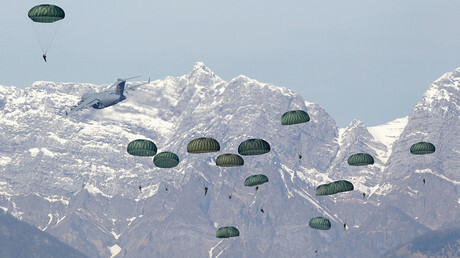 NATO officials, however, dismissed the Russian ministry’s claims. Meanwhile, Vladimir Shamanov, head of the Russian State Duma’s Defense Committee and a former Airborne Troops commander, said Russia has many options – including the deployment of Iskander-M tactical missile systems to the Kaliningrad exclave – as the US-led military bloc continues to push up on its borders, he told TASS. Whatever response Russia decides to make, it can be sure that the current wave of Russophobia, echoing through the halls of Washington and now enshrined in America’s NDAA, will not disappear anytime soon. If that comment doesn't make the EU sit up and take notice, nothing will.